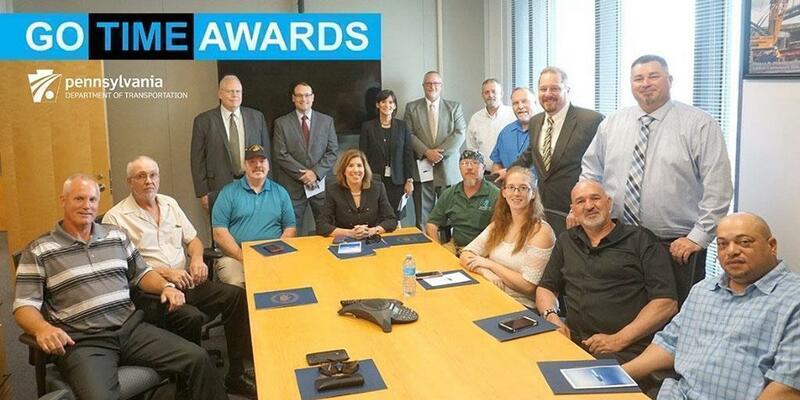 PennDOT District 6 literally flipped on the light bulb for its latest innovation to improve the transportation network in one of southeast Pennsylvania's more urbanized areas. Every year, PennDOT crews are tasked with crack sealing hundreds of miles of roadway across the Philadelphia region. These operations typically occur during non-peak daytime hours. To improve effectiveness and efficiency of the program, Montgomery County Maintenance decided to change the hours and pilot a nighttime crack sealing operation. The move was a huge success. Recently, the entire Montgomery County crack sealing team visited Harrisburg where they were awarded the governor's prestigious Go Time Award. "Initially we had reservations from a safety perspective due to visibility and higher probability of drunk drivers after dark. However, the reality has been that these operations are safer because of the dramatic reduction in traffic volumes during the overnight hours," said Montgomery County Maintenance Manager Anthony Goreski. "This is our second year with no accidents or injuries. It's been a win-win for everybody." The shift to nighttime operations allowed Montgomery County Maintenance to save hours, cut their crack sealing team in half and mitigate important health and safety concerns since the job was performed in cooler temperatures with fewer vehicles on the roadway. To provide visibility at night, all construction vehicles were equipped with an umbrella light and each crew member was given a halo light for their hardhats to ensure their safety. These design changes were crucial in adapting the new work hours and accommodating for more rural work locations that traditionally have less lighting. "New innovations like our nighttime crack sealing program are prime examples of how we strive to improve travel in the Philadelphia region," said PennDOT District 6 Executive Kenneth M. McClain. "Other districts who are similarly challenged with time restrictions have already expressed an interest in adopting these new practices."